Layia hieracioides (DC.) Hook. & Arn. Habit: Plant 5--130 cm, glandular, sweetly or pungently scented. Stem: purple-streaked, strictly erect. Leaf: < 15 cm, elliptic or linear to lanceolate or oblanceolate, sessile to +- clasping, proximal toothed or +- irregularly lobed. 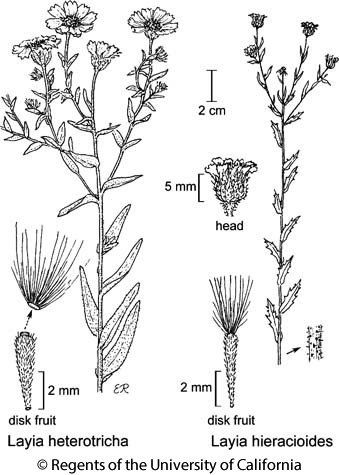 Inflorescence: peduncle < 6 cm; involucre 4--9+ mm diam, +- ellipsoid to +- obconic; phyllaries 4--9 mm, tip < folded base, bases sometimes not enfolding ray fruits. Ray Flower: 6--16; ray 1--4 mm, yellow. Disk Flower: 9--80; corolla 2.5--4.5 mm; anthers +- dark purple. Fruit: ray fruit glabrous; disk pappus of 10--16 bristles or bristle-like scales, 2--4 mm, +- equal, +- white to red-brown, plumose proximally, scabrous distally, not adaxially woolly. Chromosomes: 2n=16,32. Ecology: Open, semi-shady, or disturbed sites, in light soil; Elevation: < 1200 m. Bioregional Distribution: CW, w WTR. Flowering Time: Apr--Jul Note: Sometimes hybridizes with Layia glandulosa in southern CCo. Citation for this treatment: Bruce G. Baldwin & Susan J. Bainbridge 2012, Layia hieracioides, in Jepson Flora Project (eds.) Jepson eFlora, http://ucjeps.berkeley.edu/eflora/eflora_display.php?tid=3751, accessed on April 19, 2019. CW, w WTR. Markers link to CCH specimen records. Yellow markers indicate records that may provide evidence for eFlora range revision or may have georeferencing or identification issues. Purple markers indicate specimens collected from a garden, greenhouse, or other non-wild location.